1. Complete paperwork at the Financial Aid Office to determine if you're eligible for the student work study program. 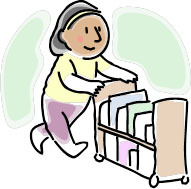 Only students eligible for work study may work in the library. 2. Once you've confirmed that you are eligible for work study, you'll need to submit an application. You can pick up an application form at the 1st floor Access Services desk or download one here or you can submit your application online using this form. 3. Fill out the application as completely as possible. Keep in mind that a position in the library often has specific needs (for example, the position requires a student to be available to work in the evenings or on weekends), so make sure you answer those questions honestly. Once an opening occurs in the library, the supervisor in charge will review the applications on file in Library Administration office and will contact students for an interview. If a position does have specific requirements, only those students who fit those requirements will be contacted. Each unit in the library is responsible for hiring its own student workers, so it's possible you might hear from more than one person in the library. Positions are available most frequently at the start of each semester, but on occasion an opening occurs during the semester or over the summer. The Available Positions link is listed at the bottom of the page.